For tire longevity and and fuel efficiency you should maintain proper tire pressure as well as regularly rotating and balancing your tires. Hitting potholes, curbs, or other unforgiving obstacles can force your tires out of alignment and cause premature and uneven tire wear, poor steering, and greater stress on your cars suspension. We offer many alignment services including computer alignments. Get the most out of your engine. Regular maintenance ensures that your engine operates at its peak effeciency and power for as long as possible. 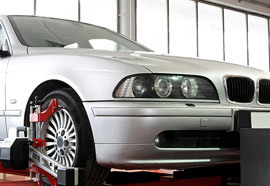 We offer A/C recharging, testing, and repair for most vehicles.